I live in New England where cranberries are plentiful and ruby red. 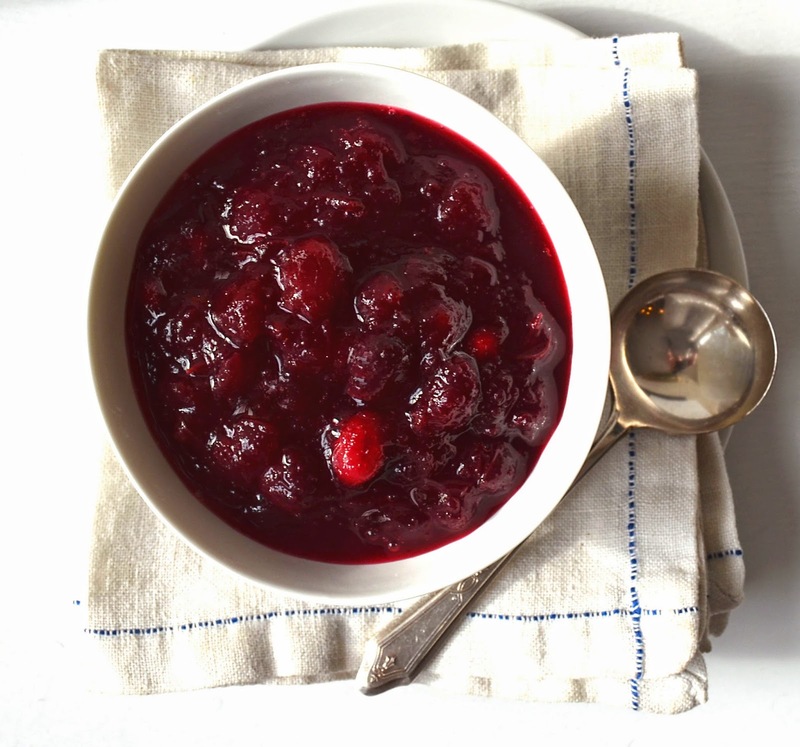 This is a French twist on Thanksgiving cranberry sauce. It's tart and tangy, thick and glossy. I make a lot of fresh pea soups using humble frozen petite peas. I've done other Thai pea soups on this blog. They're economical, fast, easy and just great to keep in your freezer for spur of the moment meals. I love making muffins. Simple ingredients are mixed with fruit and in less than thirty minutes home-baked-happiness-happens. I love muffins! I love making them because they're quick and easy. I love eating them warm with an extra hot cup of coffee in the morning or in the afternoon with a cup of tea. I keep a steady supply in my freezer to pop in the microwave for a quick, weekday breakfast. 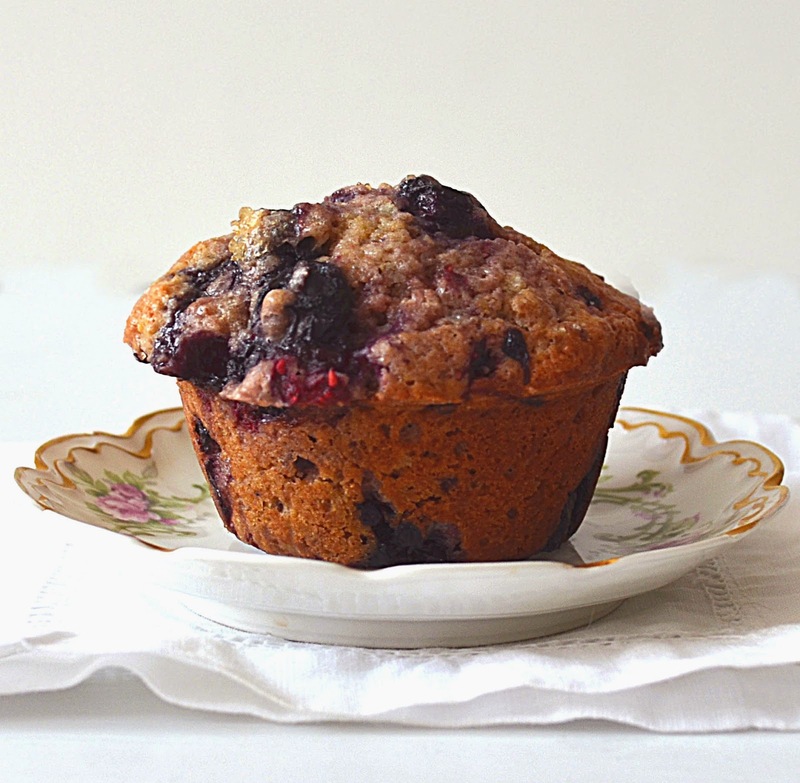 These are a riff on my favorite incredibly moist blueberry muffins that I shared on my blog Vintage Kitchen. They're made with a combination of whole wheat and regular flour. They're ultramoist, packed with berries and not too sweet (but sweet enough). 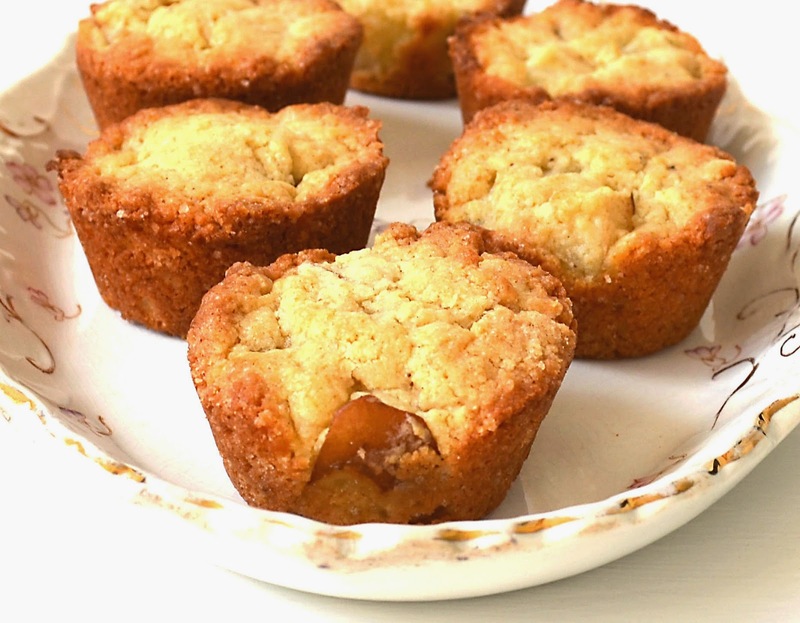 If you like your muffins sweeter, increase the sugar in the recipe to one cup. Just about any berry will work here. I've made them with frozen blueberries and raspberries too. 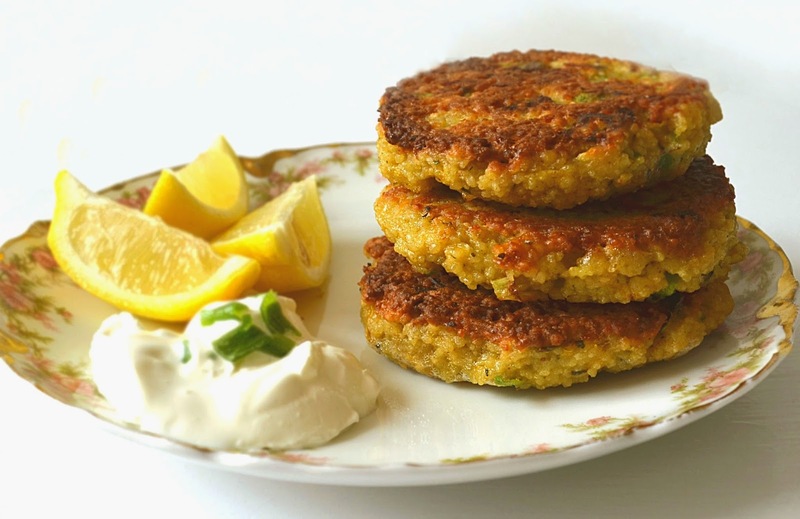 These lemony couscous cakes get their moisture and flavor from lots of scallions, the larger the better. If you can only find small scallions then just use more of them. I like to serve these cakes with my Moroccan Eggplant Tagine (the link takes you to my other blog Sew French) or a Persian Salad (recipe below). 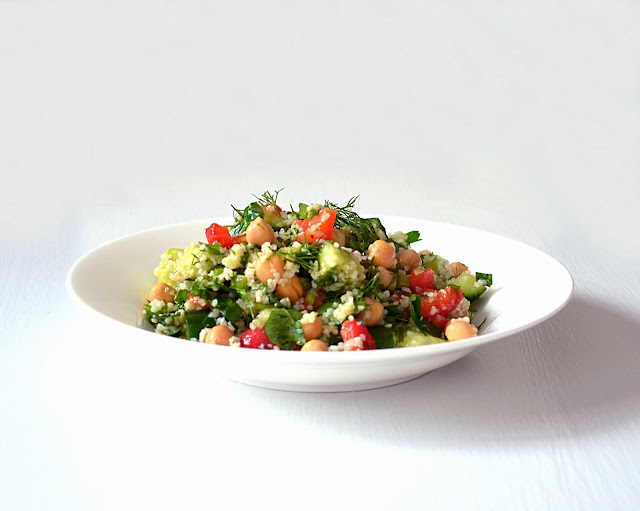 But, they're equally good with salsa, chutney, yogurt or creme fraiche and a squeeze of fresh lemon juice or lime juice. Sometimes I make them for lunch and serve them with lemon, creme fraiche and roasted veggies. 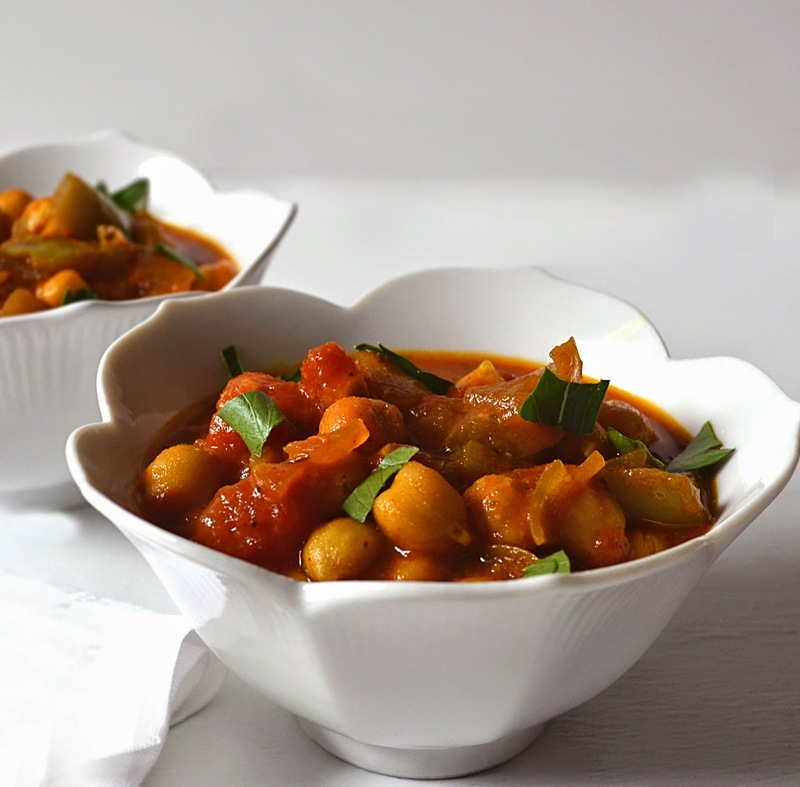 Moroccan tagines are beautifully fragrant stews made with key spices and whispers of saffron. The French are very fond of them. I make a lot of tagines, like this Eggplant Tagine (posted on my Sew French embroidery blog). To my delight, a French woman once wrote to me to say that my tagine recipes are some of the best she's ever tried. 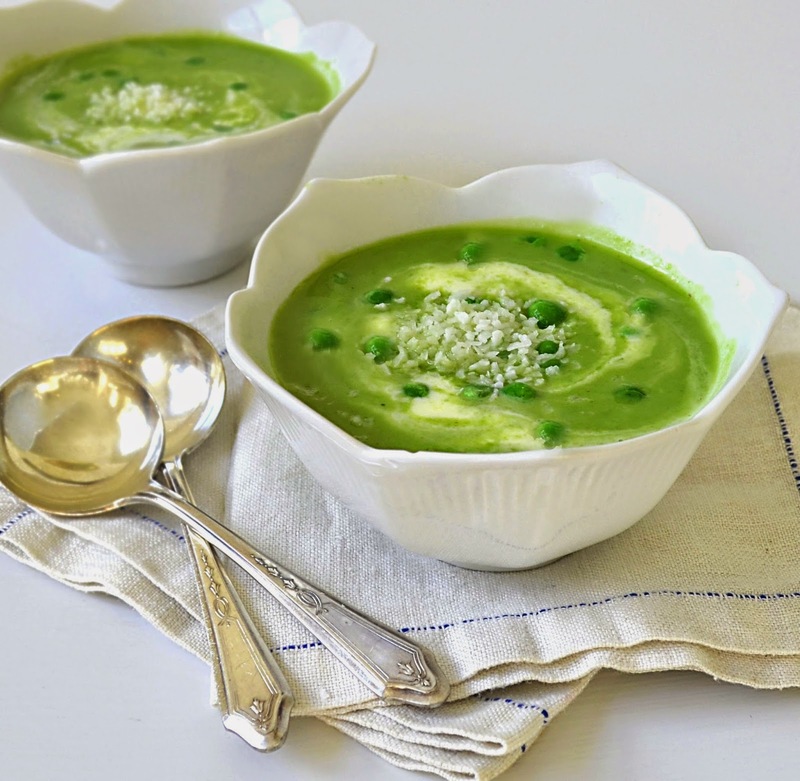 I'm Back with a New Fresh Pea Soup Recipe! 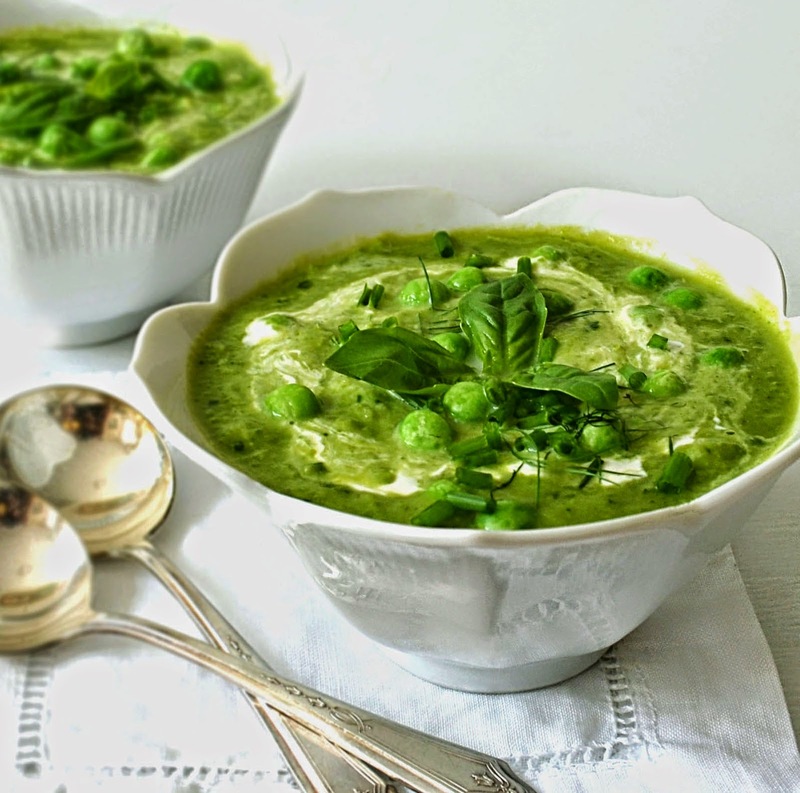 Lets talk about this creamy, dreamy, fast and easy pea soup. It's made with frozen peas. They're elevated to something quite fresh and lovely. 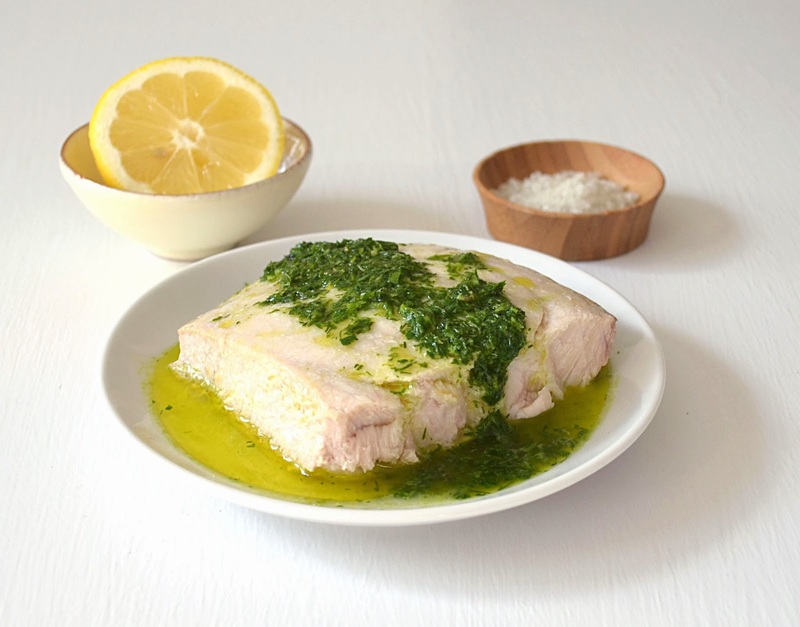 White wine, basil and fennel give it a complex flavor. If you don't love fennel, you can omit it with good results. But, it quietly complements the flavor of the peas and basil. I've been quick pea soups with frozen peas for a while now. 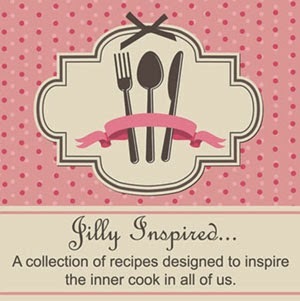 There's just a few recipes that I'll be sharing on my other blog. This is one of them. The light is changing here in Boston. The days are getting colder and shorter. The leaves are falling from the trees. Winter will soon be here. 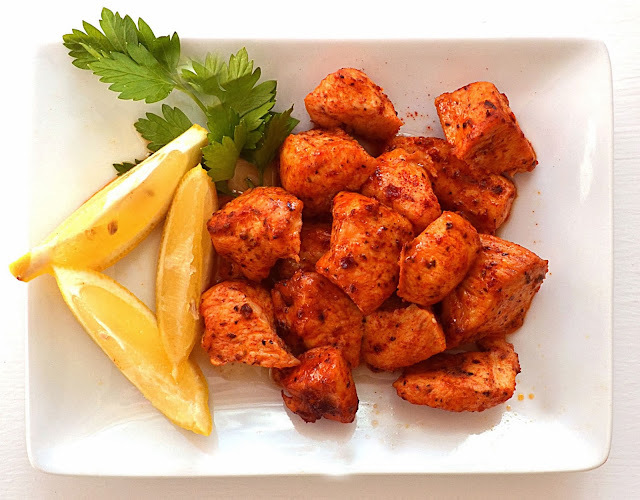 This chicken dish with smoked Spanish paprika and sweet honey is tasty and easy to prepare. It's warm and welcoming on the coldest of winter evenings. Serve with lots of lemon wedges for a bright and tangy finish. This long Veteran's Day weekend was spent meandering around Boston, visiting gorgeous portraits at the Museum of Fine Arts and cooking this creamy lentil curry. 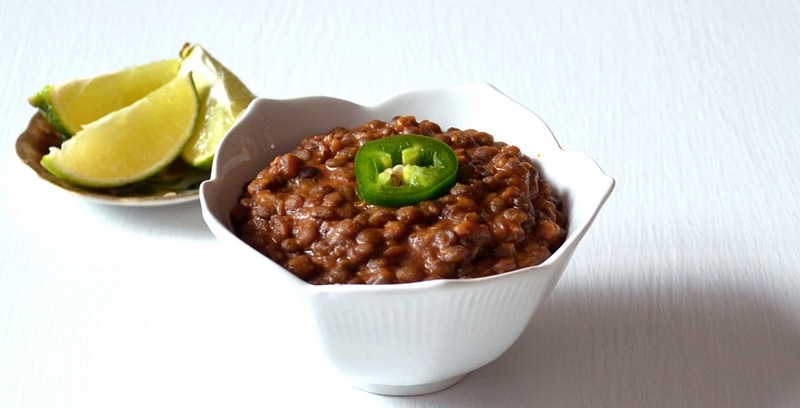 There are a few recipes I'm sharing on my other blog. This is one of them! There's a few recipes that I'll be sharing on my other blog. This is one of them. 2013 by Jill Nammar. All rights reserved. Please contact me if you wish to use any content from this blog/site. Copyright Jill Nammar.